The question, or the assumption that older households downsize as they age is one that I’ve really struggled with trying to answer. Obviously it makes theoretical sense. As one’s children grow up, you no longer need as much space, and the love/hate relationship with the yard may become more physically taxing. I hear comments along these lines quite frequently. And many urbanists rightfully point out that one of the benefits of the missing middle housing — duplexes, quads, townhomes, etc — is it better allows aging in place. That is it would provide additional housing options within existing neighborhoods so if a household does sell/downsize, they do not have to leave their longtime friends and social networks. They can remain in the same area. An added benefit in this scenario would then be a larger, single family home coming back onto the market for another family to move into. We could adjust, or tailor our housing situation with our actual housing needs. Again, all of that makes sense. But do we actually see households downsize overall, let alone stay in the neighborhood? Turning to the data shows that it it kinda, sorta does happen on a small scale. However the silver tsunami of aging Baby Boomer households means we should see an increase in the absolute number of downsizing households in the coming years, even if they do not represent a large share of the housing market overall. First, let’s set the stage with the fact that older households are increasingly living in single family homes later in life in recent decades. The chart below comes from some interesting work from Jordan Rappaport, an economist with the Kansas City Fed. As Jordan notes, there are real, positive social and medical reasons for these trends over the years. And while the delay is occurring, many older Americans do move to an apartment (or to a nursing facility) as they enter into their more advanced years. The question our office keeps coming back to is whether this represents true downsizing, or is it more about physical/medical needs and even end-of-life care? In digging into the data it looks to be mostly the latter and less of the former for most households. In fact, moving rates (either across state lines, or within the state, or within a county) are the lowest for those in their late 50s through their early 70s. There is no real retirement-age bump in migration or moving rates. Those only start to pick up as individuals and households age into their 80s, as seen in the Rappaport work above and in the Oregon work below. Now, even as moving rates and downsizing are pretty infrequent when measured across the entire population, we do know that it does occur. I call these the Most Interesting Households in the World. They don’t always move, but when they do, they downsize. 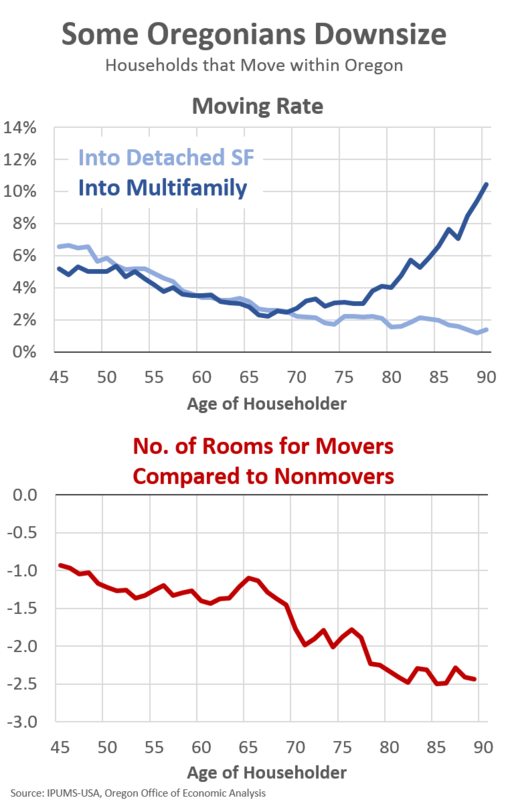 As seen in the second chart below, the households that move in their 60s, 70s, and 80s are moving into smaller housing units overall. They’re dropping around 2 rooms, which is quite a bit. Now, these are not 2 bedrooms necessarily, but two non-bathroom rooms. Think about how many rooms are in your apartment or house. For the vast majority of us, taking away 2 rooms would represent real downsizing. The work above focuses on people living on their own (or with family or roommates) and excludes those living in a retirement/nursing home. Census classifies those as group quarters. We typically ignore group quarters (dorms, prisons, hospitals, nursing homes, etc) when talking about household trends and it works most of the time. However nursing homes play an important societal role as we age. 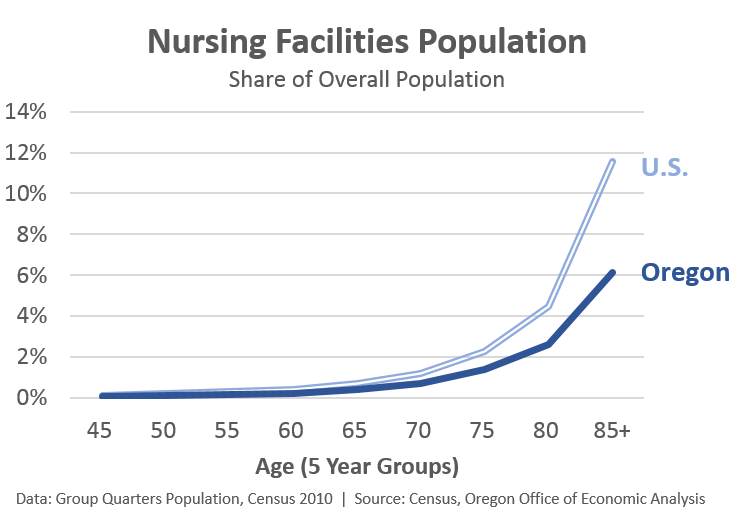 Now, even as this complicates the numbers above which ignore moves into group quarters, it is unlikely to represent a major shift in the patterns given that the nursing facilities population is, at most, ~10% of the population. Finally, it is important to note the distinction between levels and rates. All of the above focuses on migration or moving rates, and shows that not many households actually move, or downsize overall. 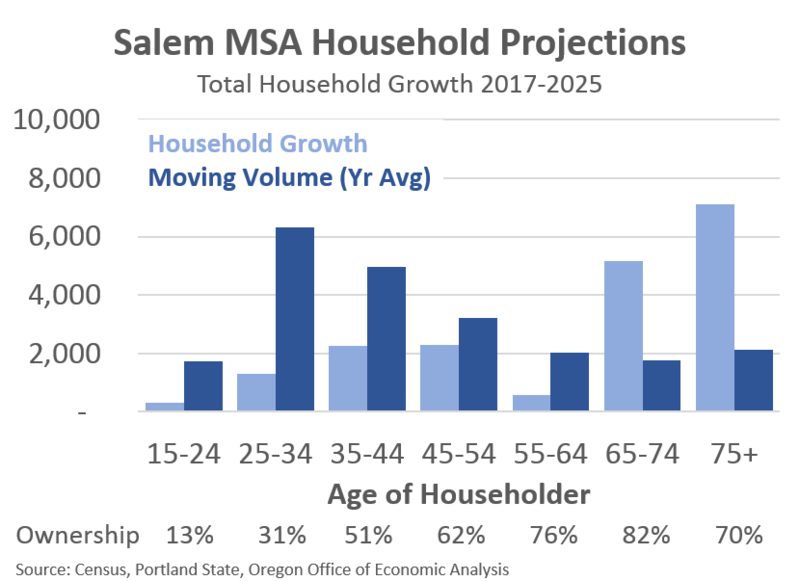 However, given the large Baby Boomer cohort is essentially in their mid-50s to their mid-70s, there are and will continue to be many more older households across the country and here in Oregon. Even with low moving rates, the fact that there will be considerably more households in their 60s, 70s, and 80s in the coming years means that the overall number of households moving, and downsizing, will increase. 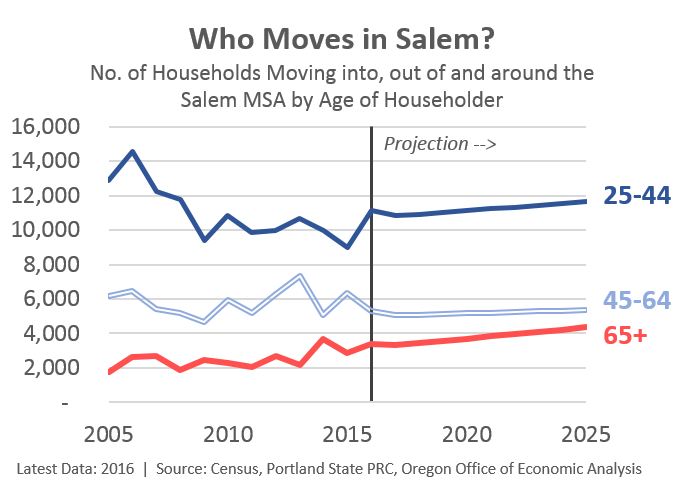 In the convoluted chart below I tried to show this for the Salem MSA, based on work I did for local realtors a few months ago. The light blue bars show the expected change in the number of households in the area over the next 8 years. The largest increases are seen among the 65-74, and 75+ year old households. The vast majority of these households are not new Salem area residents. Rather they are households that already live here, and are simply aging into these age groups. Conversely, many of the 25-44 year old households would be new residents moving into the region, even as local demographics are great. The dark blue bars take moving rates by age group and looks at how many households are expected to move each year. Given moving rates are highest for young households, we see higher volumes there. However, even with low moving rates, the absolute number of older households who are expected to move is larger today than in the past given the increasing number of older households in general. 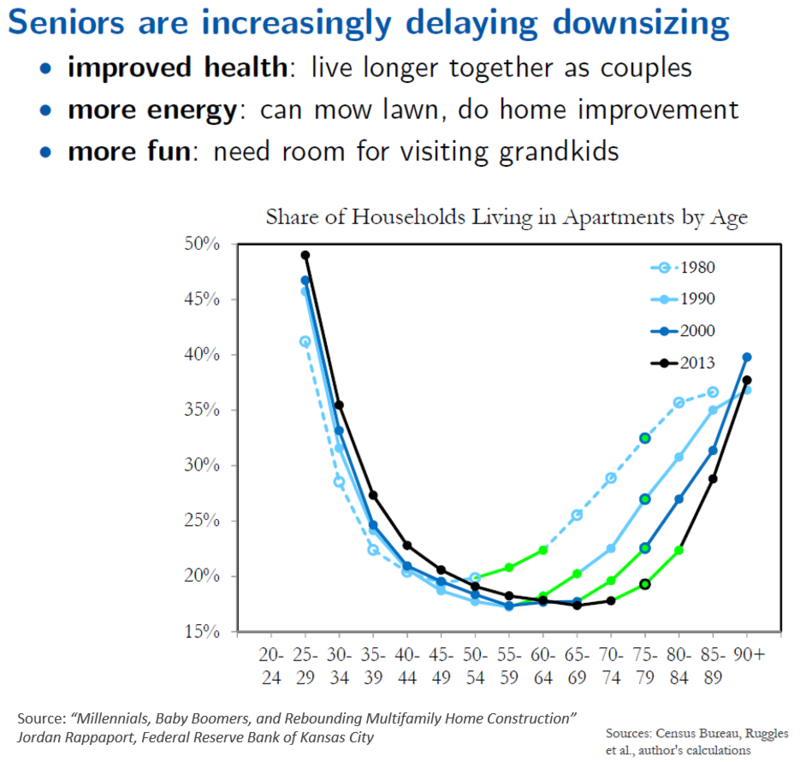 We should see more downsizing overall due to the aging population, even if the share is not rising over time. UPDATE: This chart may better show the trend and growth expectations of older households moving. Clearly, such households move at a lower rate than younger households, but given the population forecast, older moves are expected to increase in the coming years. I always enjoy your posts Josh! I just bought a house last year from an older couple who moved into a condo in the same neighborhood. But there aren’t many neighborhoods where you can do that! I wonder if there were more options in each neighborhood if you’d see more downsizing. Also, how does the weird property tax situation affect this in Oregon? Condos often have higher property taxes than a more expensive detached house, due to when they were built. So a senior with a paid off house may actually see greater monthly expenses from downsizing than if they stayed put. Thanks Holly; appreciate the kind words. Yes, I agree that if there were more options then we’d probably see more downsizing, or right-sizing of housing needs and housing decisions. On the property tax issue, I don’t know how much that is an issue. I’m not sure anyone has really looked at it that way here in Oregon. Obviously longevity is a big issue in California. While here in Oregon the discrepancies are based on how your neighborhood looked in 1995. We have (massive) horizontal inequities. But that is likely to have bled into timing inequities too, even if that’s not the fundamental aspect built into state policy, like it is in CA.